Self-identified Punks assemble sandwiches, food, and medication at the West Oakland home of Alejandra Del Pinal on June 18, 2017. 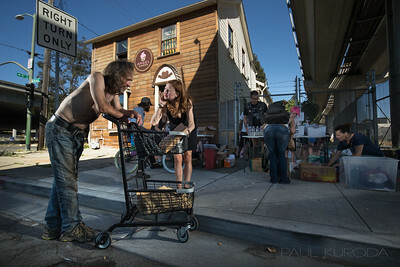 They then went to two Oakland homeless encampments nearby. 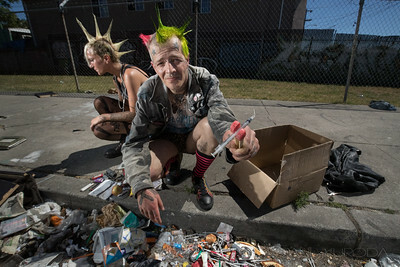 Ryan Dal Porto and Paula Rubin gather overdose opiate reversal injections before heading out to serve Oakland homeless for the self-identified Punks on June 18, 2017. Ryan Dal Porto pick up syringes in the gutter near 35th and Peralta Ave. on June 18, 2017. Liza Moore is in the background. Ryan Dal Porto and other volunteers of Punks set up at Bush and 5th streets on June 18, 2017. 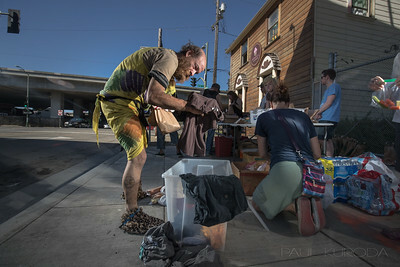 Volunteers of Punks serve homeless Mark Sparks at Bush and 5th streets on June 18, 2017. Volunteers, including Michael Sexton, 12, serve Pops Scarbrough at Bush and 5th streets on June 18, 2017. Scarbrough lives in a tent on 5th street. Tom Martins goes through some donated clothing at Bush and 5th streets on June 18, 2017. The Punks, regularly come out to help the homeless in Oakland by setting up these remote stations. 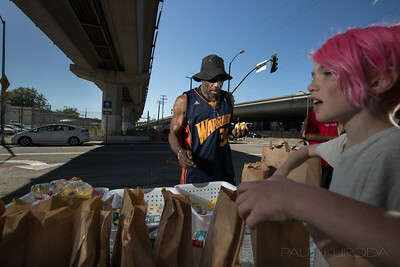 Paula Rubin of Punks, speaks to an homeless man who came to their remote food and supplies giveaway in Oakland. at Bush and 5th streets on June 18, 2017. 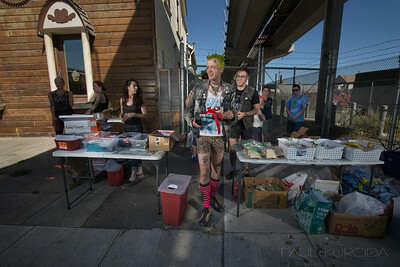 The Punks, regularly come out to help the homeless in Oakland by setting up remote stations.